How well can you spot and name the common birds that visit our school grounds and gardens? 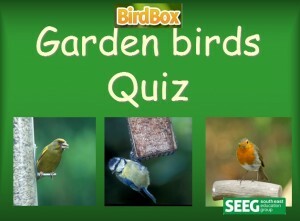 Have a go at our Bird Box Common Garden Birds Quiz. Can you name the 10 birds in the quiz and score 20 points! Just click on the image to play! 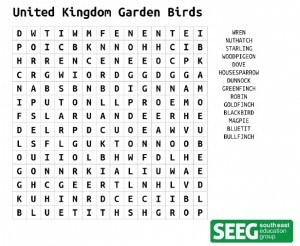 Listed in the wordsearch are 15 common United Kingdom garden birds. 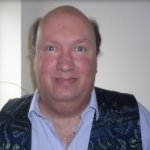 To print a copy just click on the image below. Want to learn more about these birds? Click here to visit the RSPB website. One of the most common birds we see in our gardens is The Robin. Click on the photo below and fit the 20 pieces together to make our Robin Jigsaw. Challenge yourself to complete the jigsaw in less than 60 seconds! Enjoyed the fun activities? Look out for more to do and make next week?